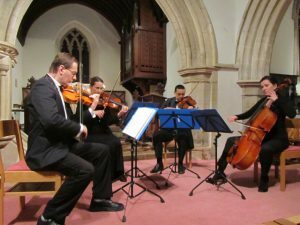 Classical Concerts in Buckinghamshire Churches – Last night, the Manor House String Quartet gave a concert of¬†Viennese¬†classics at St. Nicholas Church, Cuddington. As with our previous concerts, we benefited from marvellous organisation, with superb staging and lighting, a terrific selection of food and drink during the interval and an organised ticket sales campaign. Even the church path was cleared of all remnants of snow, giving a good access for all. We began the evening with the captivating overture to Johann Strauss the younger’s ‘Die Fledermaus’. It was a rousing opener to a concert dominated by pieces composed by members of the Strauss family (including ‘The Blue Danube’ waltz for string quartet) as well as by Josef Lanner,¬†Johannes Brahms, Franz Schubert¬†and Johann Schrammel. There were polkas, marches, galops as well as suites of waltzes, such as ‘Tales from the Vienna Woods’¬†and (near the end of the second half) five waltzes from ‘Die Fledermaus’. All of these pieces were interspersed with spoken introductions that allowed the audience a little space between the various items¬†and also gave the players a much needed breather! The church also had some¬†delicious interval refreshments on offer as well as a collection for Christian Aid. It was encouraging to see so many people who had journeyed to enjoy an evening of musicmaking. The quartet had also travelled far, with Louise (violin) braving the M25, Reiad (viola)¬†travelling from Greenwich and Magda (cello) surviving a 7 hour drive from Wales the day before. They played¬†superbly and the whole concert was very well received.